To continue our Bauhaus 100 series, here's a look at 10 of the most influential pieces of furniture created by Bauhaus designers, from Marcel Breuer's bicycle-inspired Wassily Chair to Josef Hartwig's minimal chess set. Known for developing a distinctive, modern style built on the principle of simplicity, teachers and students from the Bauhaus school designed some of the 20th century's most iconic pieces of furniture. Bauhaus furniture was designed to be functional above all other qualities. Stripped down to their basic elements, fundamental components like tabletops or legs were typically reduced to simple geometric forms. Bauhaus designers wanted to create aesthetically pleasing objects, but also wanted their products to be available to a mass public – the simple designs of each furniture piece made it easier to produce them efficiently. Modern industrial techniques also made certain materials more readily available, such as steel, glass, plywood and plastic. Such materials were seen as unconventional for use in furniture making at the time, but facilitated mass production and promoted the Bauhaus' spirit of practicality. The Wassily Chair, also known as the Model B3 chair, was designed by Hungarian-born modernist architect and furniture designer Breuer between 1925-1926. Breuer was inspired to create the chair while riding his bicycle – he envisioned taking the tubular steel used for the handlebars and bending it into pieces of furniture. Breuer took the traditional form of an overstuffed club chair and simplified it down until it was just an outline, with a canvas seat, back and arms. The chair soon became known as the Wassily Chair, named after the Russian painter Wassily Kandinsky – Breuer's friend and fellow Bauhaus instructor – who praised the design when it was first produced. Kandinsky's work was the inspiration for German architect Peter Keler's Baby Cradle, which he designed for the first Bauhaus exhibition in the Haus am Horn in Weimar in 1923. Keler was directly inspired by Kandinsky's book on colour theory from 1911, which outlined his feelings about colour and its psychological effect on humans. Composed of simple shapes like triangles and rectangles, and primary colours, the cradle features a colour-block body in red and yellow, with a blue circular rocker – a palette recognised as a trademark of the Bauhaus. Munich-born artist Josef Hartwig designed a 32-piece chess set for the Bauhaus between 1923 and 1924 using minimal lines, circles and squares, to reduce the pieces to their basic function of movement. For example, the X-shaped bishop represents its diagonal movements, while the near-limitless movements of the queen are represented with a sphere on top of a cube. By eliminating all religious and monarchical symbols typically used in chess, the German designer aimed to redesign the game for a modern age. The Brno Chair, designed by modernist architect Ludwig Mies van der Rohe between 1929 and 1930, also exemplifies the Bauhaus principle of reducing objects to their basic elements. The design is based on the idea that it is not necessary for a chair to have four legs when it can be built in a cantilever-style, using a single C-shaped bar to support the entire seat. In 1924, German artist Marianne Brandt took the design of a conventional teapot and stripped it of any ornament to create her geometric metal tea infuser and strainer. Seven centimetres high, the tea infuser is petite as a result of its function – unlike conventional teapots, it is intended to distill a concentrated extract that, when combined with hot water in the cup, can produce tea of any desired strength. Simple in form and colour, the silver hemisphere body is supported by a crossbar structure, while the D-shaped ebony handle is positioned high up on the body for easy pouring. This simple plywood wardrobe created by Czech designer Josef Pohl in 1929 became known as the "Bachelor's Wardrobe" due to its mobile and space-saving qualities. Designed to be versatile and convenient, the rectangular wardrobe is mounted on castors wheels, making it easy to move into different locations. It was designed to enable people to furnish their apartments at an affordable price. With hanging space and shelf storage at the side, and a shoe cupboard inside, the wardrobe is compact and efficient, set in a minimal frame without any complex gadgets. 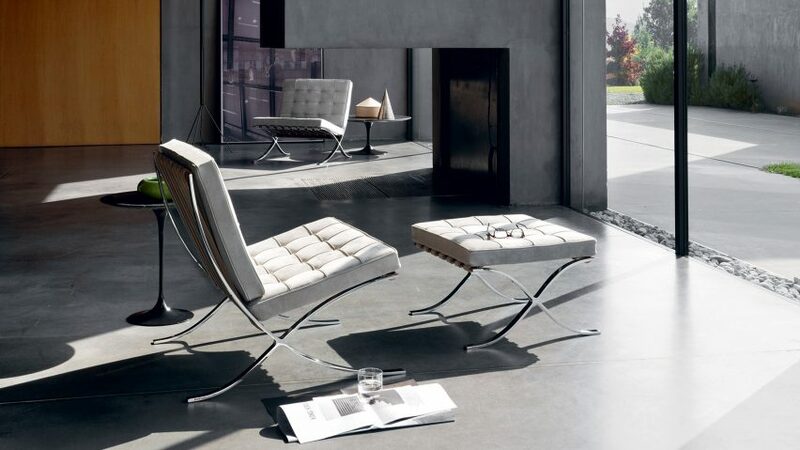 Created in 1929 for the Barcelona International Exposition, the Barcelona Chair was designed by Bauhaus director Ludwig Mies van der Rohe in collaboration with architect Lilly Reich. It features two slim rectangular cushions over a light, stainless-steel frame. The chair frame was initially designed to be bolted together, but it was redesigned in 1950 using stainless steel, allowing it to be formed from one seamless piece of metal. Bovine leather was also used in place of the original ivory-coloured pigskin. This table lamp designed by German designer Wilhelm Wagenfeld and Swiss designer Carl Jakob Jucker, became known as the Bauhaus Lamp, embodying a key Bauhaus principle that "form follows function". Comprising a circular base, a cylindrical shaft and a spherical shade, the light boasts a simple, geometric shape that is as economical as possible in terms of time and materials. The lamp is made from precisely cut glass and metal with an opaque lamp shade – a type formerly used only for industrial lighting. This modernist door handle by Bauhaus founder and German architect Walter Gropius was first put into mass production in 1923, after being originally designed for the Fagus factory in Alfeld, Germany. Made from nickel-plated brass and produced by ironmongery manufacturer Izé, the industrial-style door handle comprises a cylindrical grip and a cranked, squared stem. According to Izé, the door handle is the most commercially successful product to emerge from the Bauhaus. German-born American artist Josef Albers designed this set of modern accent tables while serving as the artistic director of the furniture workshop at the Bauhaus from 1926 to 1927. Each table was made from solid oak and lacquered acrylic glass. Known for his colourful, geometric artworks, Albers applied the same style to the tables, giving each a distinctive colour of blue, red, yellow and white. The Bauhaus is the most influential art and design school in history. To mark the centenary of the school's founding, we've created a series of articles exploring the school's key figures and projects.